Vĩnh biệt Tugumi - M's blog. - This time, I'm really glad that Yoshimoto didn't follow her usual plot: the-daily-life-of-a-traumatized-young-woman-and-then-she-falls-in-love-with-an-equally-traumatized-and-strange-person. - The descriptions of the sceneries, they are strangely calm and relaxing, which evoked in me a nostalgic feeling. - Even though there are a lot of details about Tsugumi, she and other characters still lack depth, even though your average Yoshimoto Banana's novel is very detailed. - Yoshimoto has written a different plot this time, however, the book is not insteresting enough to capture the readers' attention. I felt that as time pass by, I will soon forget that I has once read this novel. - I began to think that Yoshimoto's novels are indistinguishable. From Kitchen, to Amrita and Tsugumi, they are very similar in some way. 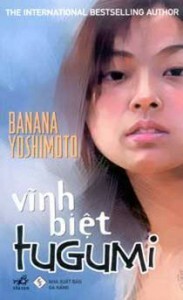 - Nhã Nam Publisher has greatly dissapointed me, especially the title. I considered changing a character's name is disrespect toward the author. - The cover is just horrible. From the font choices to the colour and the illustration. Chỉ có cá và canh tương, bố có ăn cơm không? Assuming that Maria was talking about fish and miso soup, why would you translate it that way? Normally people would immediately think of doenjang jjigae. Conclusion: Although it still has many flaws, this would still makes a relaxing read once in a while. Tsugumi, best enjoy with a cup of mineral water.